One of the biggest challenges a jewelry designer has is capturing, in fine gold or precious metals, the very essence of their subject in a way so beautiful and powerful that it can not be resisted. When we look at fine gold horse jewelry, many of the pieces that most successfully capture the energy and spirit of the horse feature horsehead motifs. For example, check out this 14K Gold Asian Horse Charm. The picture is enlarged to show detail – in real life, this charm is just under an inch square. The horsehead is heavily stylized – but instantly recognizable to anyone who’s seen a horse stop at the end of a breath-taking run to take in his surroundings only long enough to decide which way he wants to charge next. This is a fairly weighty and substantial charm – some people prefer to wear it as a pendant. It’s also part of our Made in the USA horse jewelry collection. Charm bracelets continue to be one of the strongest fashion trends. Pandora created a sensation with their bead style charms. Exclusive to Show Stable Artisans is our collection of Equestrian Themed Bead Charms that can be worn with a Pandora or similar screw-style charm bracelet. Here’s the 14K Gold Pandora Style Horse Head Bead Charm. This horsehead charm is a realistic rendering with lifelike detail. 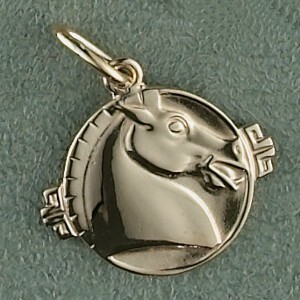 This charm weight 5.7 grams: it’s a high quality, substantial piece of fine horse jewelry. It’s also available in sterling silver. 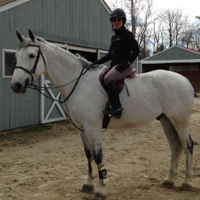 Proudly made in the USA for your horse jewelry collection. Are you a fan of vintage horse jewelry? 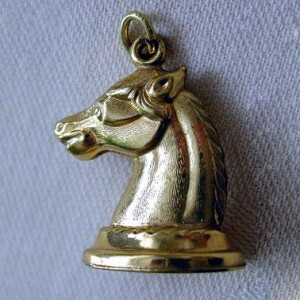 Then you’ll love this Vintage gold horse head fob pendant. It’s a great antique piece for the horse lover.